>Ooh, you lucky people you. It’s another report fresh from London courtesy of that lovely Miss Keren… She spoils us. Which is lucky since I’m so bloody manically busy, I just let you down (Yes, I am fishing for reassurance). I do love a bit of a story behind a product, maybe it’s because I work in book publishing, but even Michelle Obama likes this story. Once upon a time, some scientist-types noticed that when the Swiss apple fell from the tree it did not wrinkle for a long, long time. 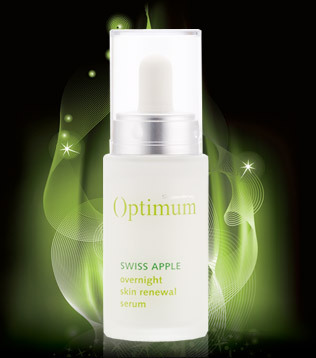 Hmmm, they thought, can we extract something from said apple to make a miracle cream. For a while the miracle cream was only available to those with a husband in the white house… But thanks to the lovely people at Superdrug we can all afford to have a go. I have been using them both* for a few weeks now, and the first thing I noticed was the smell – fresh and (unsurprisingly) apple-y, as I find most miracle creams can smell a bit, well… Plain, if you know what I mean. I have to admit, even if this is a bit annoying, I don’t have massive amount of wrinkles apart from a mahoosive frown line acquired from 10 years of glaring at people who crush me on the tube. But I do have a tendency to fine dehydration lines around my eyes, and I can say it has rehydrated my tired looking skin and my face feels super-smooth. >Ever since i turned 25, i have people left, right and centre telling me how wrinkle-wise it's all downhill from here (which i already knew because of my job) as the skin is classed as mature from then on (shame the same cannot be said for the owner of said skin!) but it seems that you've managed to find me the perfect face goo to get them to shut up. Thankyooouuuu! I love my job as a beauty therapist but sometimes i think i was happier not knowing that i am now destined to own only antiageing lotions and potions…..Thanks Lindsey, you're a wrinkle saver! oooh sorry that link could go to: LawDog323(AT)aol.com thanks so very much! !